The road to the resurrection of the original Captain America is now laid before us. With Captain America: Reborn coming out next month, there was a ton of hubub all about this issue. To be honest, it’s not entirely worth that craziness, since for everyone who’s actually been reading this book, the method for Cap’s return was telegraphed well over a year ago. This issue doesn’t provide any sudden revelations. However, it does briefly show each of the characters touched by Cap’s death. In particular, Sharon Carter, Bad Cap, Rikki Barnes, Patriot, Crossbones, Sin, the Red Skull, the Black Widow, Luke Cage, the Falcon, Ronin, and of course, the current Cap, Bucky Barnes. Sharon Carter realizes that her memory of killing Cap is a bit faulty and that, perhaps, she wasn’t the killer. Then, at a rally to mark the one year anniversary of his death, Norman Osborn, a.k.a. the Iron Patriot, steals Cap’s thunder by saying that the rally was done with H.A.M.M.E.R. approval. Then, Sharon reveals her findings to the gang. 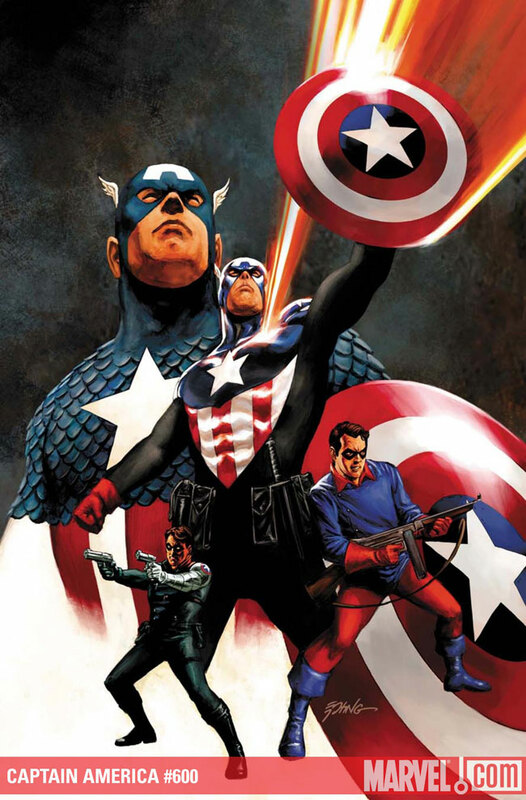 Plus, we get little revisitations of the Cap run by Roger Sterns and a great emotional story by Mark Waid, as well as a reprinting of a great quick origin story by Alex Ross and Paul Dini.